The new Páirc Uí Chaoimh is a 45,000 capacity stadium. Spectators now have the ability to walk around the full circumference of the stadium. The stadium is fully wheelchair accessible. The North Stand and South Stand combined accommodates 21,000 spectators seated. Both the City and Blackrock terrace have a maximum capacity of 24,000 standing. The Upper Tier of the South Stand is accessed from ground level in front of the 4G Pitch. There are two dedicated Premium level entrances at either end of the South Stand and the Lower Tier of the South Stand turnstiles are accessed on the podium level. 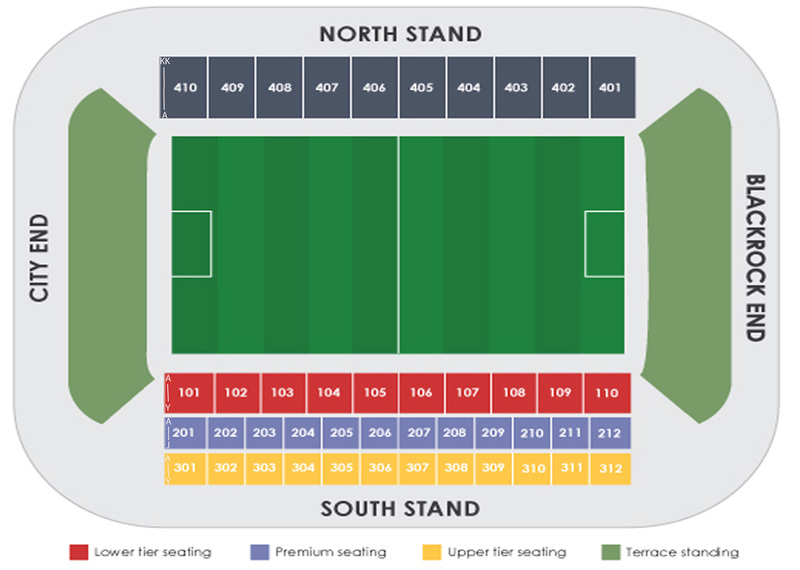 Row A is the closest to the pitch in both stands.